Back in October 2008, myself and 11 others set out on the first /dev/fort expedition. 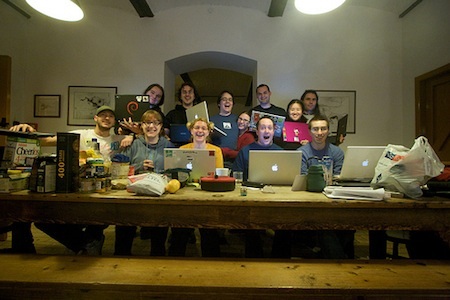 The idea was simple: gather a dozen geeks, rent a fort, take food and laptops and see what we could build in a week. The fort was Fort Clonque on Alderney in the Channel Islands, managed by the Landmark Trust. We spent an incredibly entertaining week there exploring Nazi bunkers, cooking, eating and coding up a storm. It ended up taking slightly longer than a week to finish, but 14 months later the result of our combined efforts can finally be revealed: WildlifeNearYou.com! WildlifeNearYou is a site for people who like to see animals. Have you ever wanted to know where your nearest Llama is? Search for "llamas near brighton" and you’ll see that there’s one 18 miles away at Ashdown Forest Llama Farm. Or you can see all the places we know about in France, or all the trips I’ve been on, or everywhere you can see a Red Panda. The data comes from user contributions: you can use WildlifeNearYou to track your trips to wildlife places and list the animals that you see there. We can only tell you about animals that someone else has already spotted. Once you’ve added some trips, you can import your Flickr photos and match them up with trips and species. We’ll be adding a feature in the future that will push machine tags and other metadata back to Flickr for you, if you so choose. You can read more about WildlifeNearYou on the site’s about page and FAQ. Please don’t hesitate to send us feedback! So why did it take so long to finally launch it? A whole bunch of reasons. Week long marathon hacking sessions are an amazing way to generate a ton of interesting ideas and build a whole bunch of functionality, but it’s very hard to get a single cohesive whole at the end of it. Tying up the loose ends is a pretty big job and is severely hampered by the fort residents returning to their real lives, where hacking for 5 hours straight on a cool easter egg suddenly doesn’t seem quite so appealing. We also got stuck in a cycle of “just one more thing”. On the fort we didn’t have internet access, so internet-dependent features like Freebase integration, Google Maps, Flickr imports and OpenID had to be left until later (“they’ll only take a few hours” no longer works once you’re off /dev/fort time). The biggest problem though was perfectionism. The longer a side-project drags on for, the more important it feels to make it “just perfect” before releasing it to the world. Finally, on New Year’s Day, Nat and I decided we had had enough. Our resolution was to “ship the thing within a week, no matter what state it’s in”. We’re a few days late, but it’s finally live. WildlifeNearYou is by far the most fun website I’ve ever worked on. To all twelve of my intrepid fort companions: congratulations—we made a thing! This is WildlifeNearYou: It began on a fort... by Simon Willison, posted on 12th January 2010.